It's been a while since my last under $100 post, and I found so many great pieces a round-up was in order! 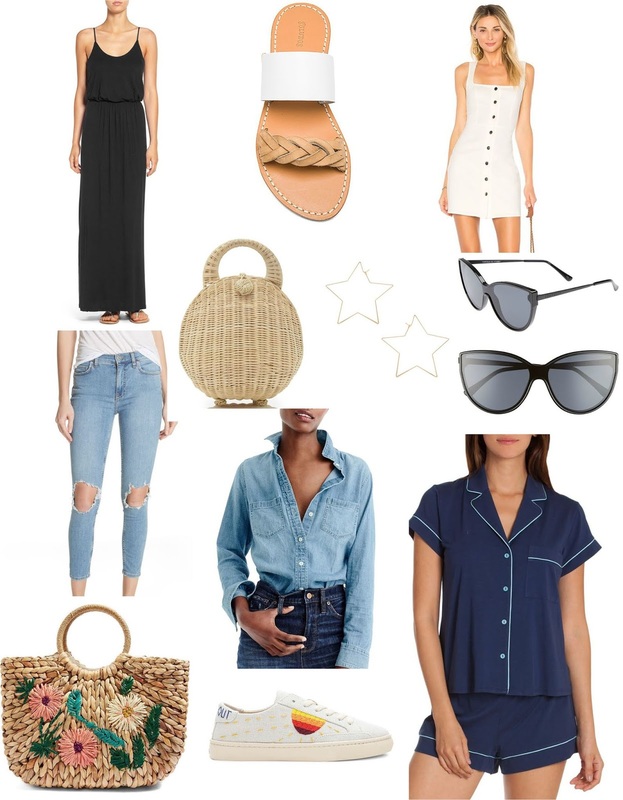 Most of the pieces above are great classics or things that will easily transition into one's closet, but be sure to scroll to the bottom of the post because I included tons more under $100 picks. 1. Black Maxi Dress - Nothing is more classic than a black maxi dress for summer. And this one is under $50! 2. Braided Sandals - A basic neutral sandal with a twist (literally!). 3. White Mini Dress - The most simple white mini dress. This would be perfect with sneakers, wedges or even dressed up with heels. 4. Jeans (more sizes here) - I have these jeans (I'm wearing them here) and I can't say enough good things about them! I love them mostly because they come right above my ankle which is so hard for me to find (#shortinseamproblems). 5. Wicker Bag - Cult Gaia did it again with another cute summer bag! It comes in black too. 6. Star Earrings - These look so incredibly lightweight and I love that the star shape goes through the ear. A nice twist on traditional hoops. 7. Black Sunglasses - Basic black cat eye sunglasses. YES! 9. Chambray Top - I've had a chambray blouse in my closet for longer than I can remember, and it's something I will never be without. This is my favorite one - the fit and color are the best. 10. Sunset Sneakers - No boring ol' white sneakers here - I love the sunset detailing! 11. Pajamas - My girlfriend is going on a trip to Italy in a few weeks and I have been helping her shop for all of her activities and events. The one thing she was missing was a cute pajama set and I suggested this one. She just texted me on Saturday to say she bought it and loves it! In addition to my picks above, scroll through the widgets below for more under $100 pieces!